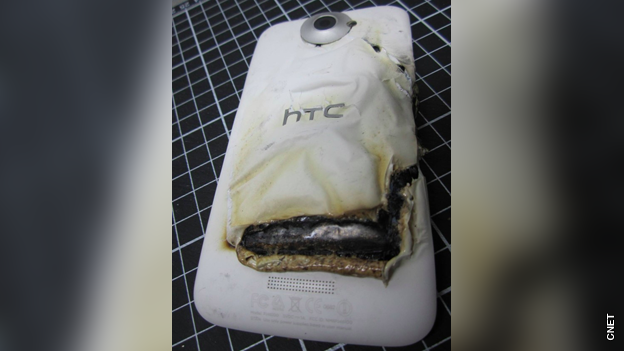 A HTC One X has become the latest smartphone to catch fire while charging. According to reports, the One X in question belonged to a man in Taiwan. He reportedly saw the phone combusting and melting the case while it was on charge. He managed to turn off the power to the phone. The owner was unhurt in the incident. This is the latest in a spate of mobile phones catching fire. Many of the recent incidents have been put down to counterfeit and third party chargers being used. It is unknown if the HTC One X that caught fire last week was being charged with an official charger or not. In recent months, Samsung Galaxy phones have caught fire in Germany and Dubai. The cause of those fires is yet to be made public. In a separate incident last month, a Chinese bride-to-be was killed after being electrocuted by her iPhone. It is alleged the she was using the phone while charging. The incident prompted Apple to try and tackle the increasing problem of fake and poorly built third party chargers on the market. Last week, it was announced that the iPhone maker had expanded its charger take back programme to the UK and several other countries in an attempt to combat the problem.